A relatively short notice event came my way a couple of weeks ago to cook for 40 guests at the Hannah Barry Gallery in Peckham. 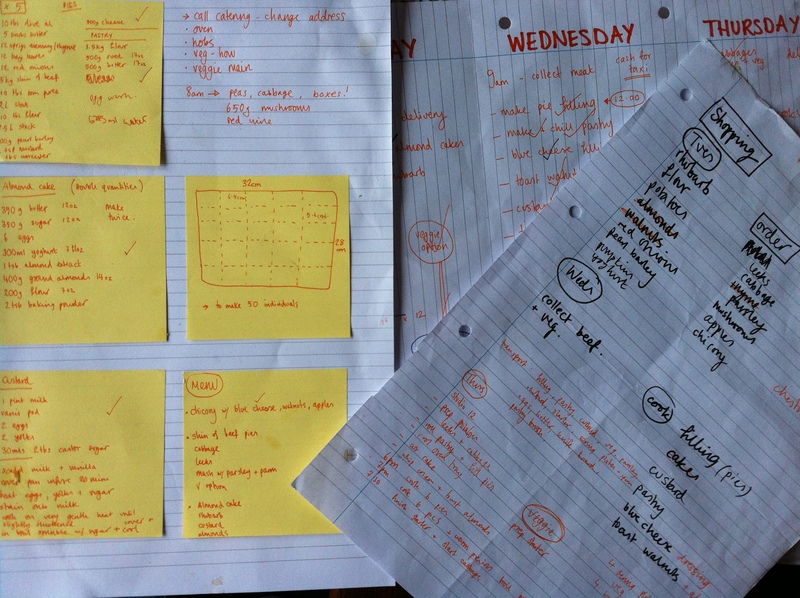 40 is the high end of what I can do easily due to the size of my little kitchen but with a little bit of experimentation and a lot of post-its and schedules I can make it work! We decided on a traditional British theme which was essentially Pie ‘n’ Mash and Rhubarb ‘n’ Custard. I wanted it to have a cafeteria feel and give people the opportunity to share their food and meet each other over dinner so each pie was to share between 4. The capabilities of cooking in a Gallery with no kitchen and no heating (!) meant I had to come up with something that could be cooked in an impromptu space, be served quickly and stay piping hot A tall order, but one to relish. Sharing is something I like to focus on in my catering as I think one of the main joys of food is to share it with others and to make an event of it. The recipes I’d like to share with you are for the suet pastry which was unbelievably good and a perfect vanilla custard. The pastry I made using vegetarian suet as I also had to whip up a few mushroom pies for the vegetarians and I only wanted to make one batch of pastry. It is a fantastic and versatile pastry that puffs up beautifully in the oven, is flaky and rich and resilient enough to last a car journey and not get soggy! Chop your butter into small cubes and add this to the mix. Slowly mix the butter into the flour with your fingers as you would when making a crumble. Lift it up and rub the butter between your fingers, you want to make flakes rather than a breadcrumb texture. When you have no large lumps left and the texture is even pour in the water a little at a time and shape the pastry into a rough ball. It takes a lot more water than a shortcrust pastry and should be sticky so don’t be afraid to add it all. When you are ready to use the pastry dust a surface and your rolling pin with flour and roll your pastry to the size you need. Because it is quite sticky you will need a lot of flour to keep the pastry from sticking and keep turning it. It is pretty flexible because if the high liquid content and is easier to manouvre than regular short crust or rough puff pastry. Now brush a little of the egg wash on the edge of your pie dish and lift the pastry onto the top. To stick and shape it nicely slice the the overhanging pastry off by angling your knife away from the edge so you have a bit more to play with. Now get a fork and gently press all around the edges then use your thumb and forefinger to make little pinches all around. If you have any pastry left over, freeze it or make some decorations! 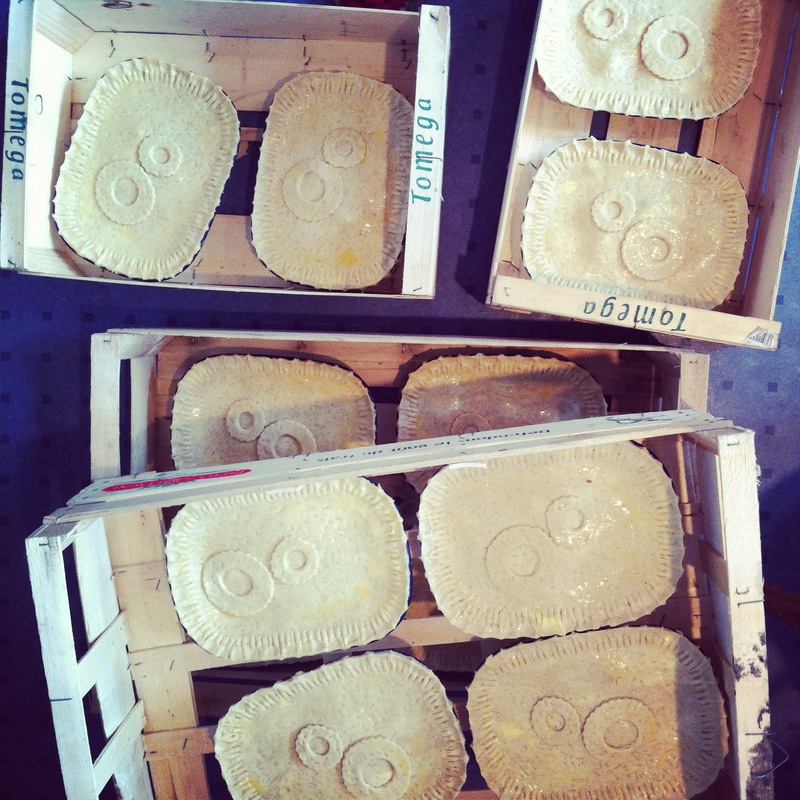 The decor in the picture of my pies is meant to depict cogs.. I don’t know quite how successful that was, but they look nice! 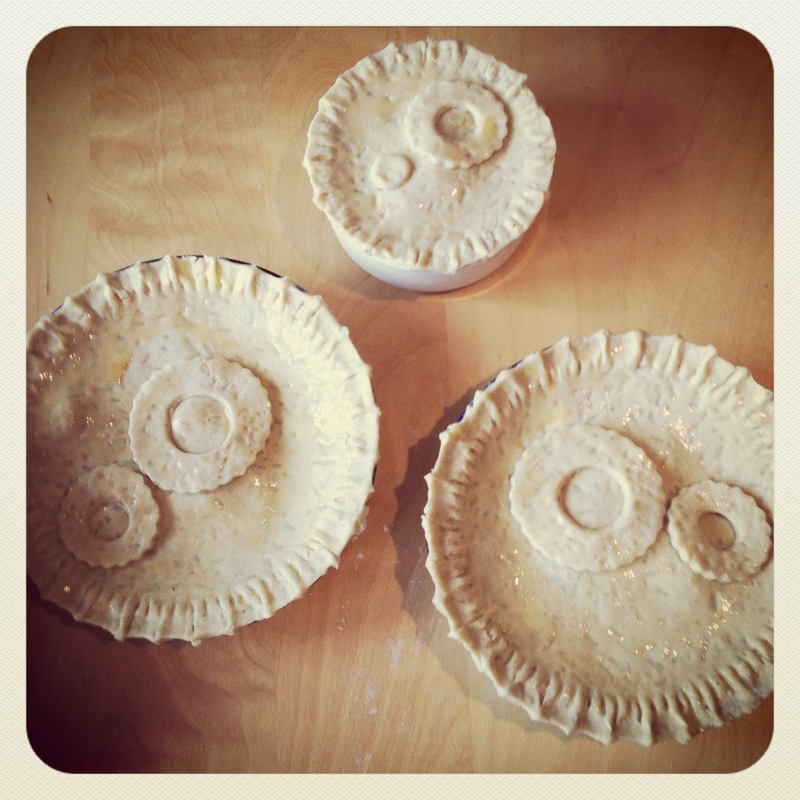 I also made a few little vegetarian pies with a mushroom ragout filling scented with red wine and thyme. To finish them off brush the pastry with egg wash and bake at Gas 4 (180 degrees) for around 1 hour. And now for pudding. There really isn’t anything more delicate and beautiful than a real custard. It is a little time consuming but if you have the patience to stir and watch and sit and relax, then anyone can do it. Essentially custard is just milk eggs and sugar, stirred slowly over a very low heat until it thickens slightly to coat the back of a spoon. It is not gloopy like custard from a tin or a powder. Most online recipes I found seem to use cornflour to thicken it but this is almost certainly cheating and is definitely unnecessary. 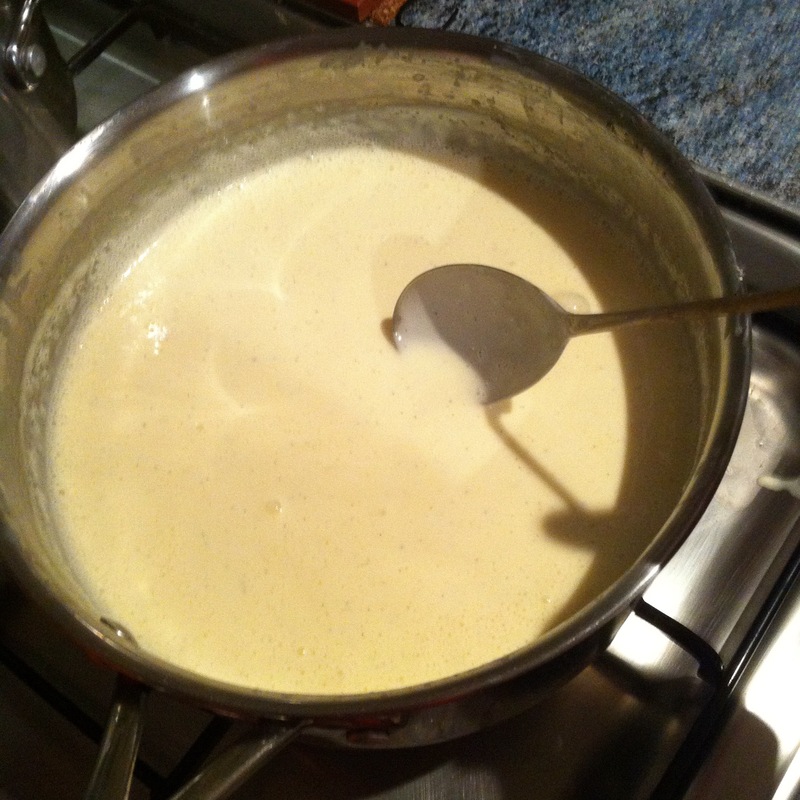 The result can not possibly be as smooth or as silky as a true labour of love custard. 2tbs castor sugar plus extra for sprinkling. In the meantime, put the eggs, egg yolks and sugar in a large bowl and whisk thoroughly until it foams. Now turn the heat on under the milk infusion to it’s lowest setting and strain the eggs into it to make sure there are no lumps. Now get a whisk or a wooden spoon, and stir slowly and constantly for anywhere up to 30 minutes until the custard coats the back of a spoon. Do not stop stirring otherwise you will get lumps. Mine took 45 minutes but I had double this quantity so yours should take around 20. When it is done either serve immediately or if you have to serve it later, pour the custard into a bowl and sprinkle castor sugar over the surface. This will stop it developing a skin. To re-heat, put it back into the pan, and again, on a low heat and with constant stirring bring it back up to the required temperature. 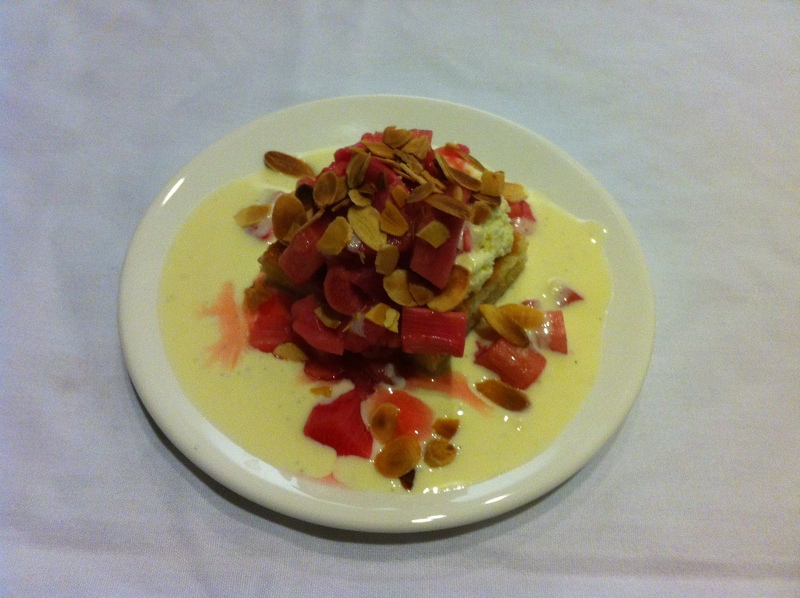 I served the custard with a little square of almond cake, (recipe in earlier post just scroll down for a while) and rhubarb roasted with ginger syrup sprinkled with toasted flaked almonds. The picture below is my own enormous portion! It was delicious. 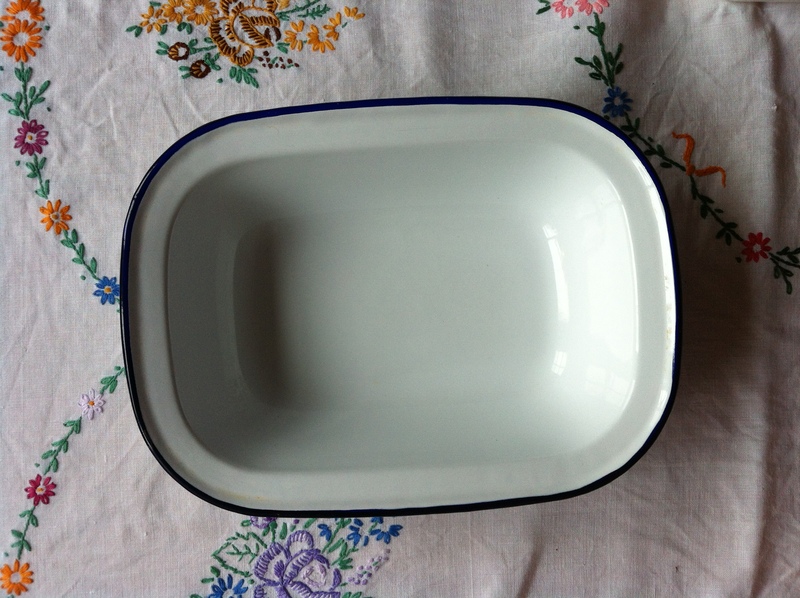 Everyone else had a far more elegant plate… honest.